Wherever you are, look out for tonight’s full moon – it’s supposedly the largest, roundest moon of the year, celebrated across China by the Mid-Autumn Festival. The moon’s perfect circle symbolises unity with family and friends, and the holiday is traditionally cause for a big family dinner, with children allowed to stay up late to watch the moon and play with candle-lit lanterns, dimly echoing the moon’s light. 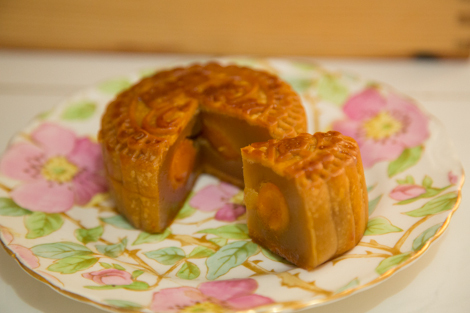 If you fancy something lighter for dinner tonight, I heartily recommend the dish below, which uses salty duck egg yolks – one of the traditional mooncake fillings. Enjoy! 1) Heat a saucepan of water over a high heat. While the water comes to the boil, prepare the tofu. 2) Drain the tofu and tip it into a shallow bowl (the tofu will be both cooked and served in the same dish). Chop it about a bit with a fork until it’s in an even layer over the bottom of the bowl – try to keep the chunks fairly large, as this will give the finished dish a better texture. 3) Shell the eggs and remove the yolks, which should be solid even if the whites are still liquid. Chop or mash these into small chunks and sprinkle over the tofu. 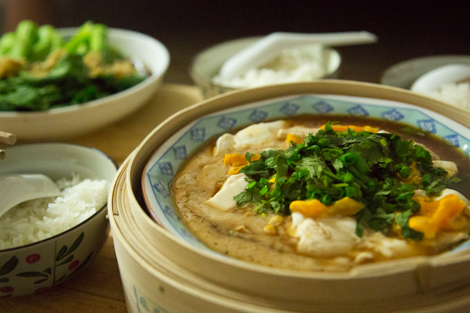 Drizzle the soy sauce and oil over the top of the egg and tofu and place the dish inside the steamer basket. 4) When your water is boiling, put the lid on the steamer basket and place the whole thing on top of the saucepan. Reduce the heat slightly and steam for 8-10 minutes.